RIA, Margibi County – The United States Embassy through its international development organization, USAID has presented ground services equipment to the Roberts International Airport outside Monrovia, aimed at building the capacity of Liberia’s only outstanding landing field. The equipment include two aircraft cargo loaders, two baggage tugs and 15 containers dollies which the U.S. Embassy said is in continuation of its commitment to the RIA. They were presented to the management of the Liberia Airport Authority Tuesday, by U.S. Ambassador, Christine Elder. During the height of the Ebola crisis in Liberia the US Embassy promised to strengthen the airport capacity to better connect Liberia to the global community. According to the Embassy, the RIA was the indispensable gateway for health workers, humanitarian volunteers and medical equipment supplies that proved crucial to ending the crisis and providing needed support. During the presentation at the RIA, Ambassador Elder noted that the equipment would expand the airport’s capacity to meet international standards for air cargo and baggage handling. 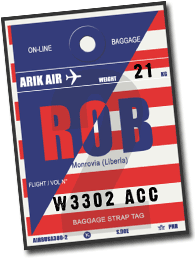 “This equipment will bring increased efficiency and quality service to Robert’s baggage handling system, ensuring passengers are drawn to Liberia,” Elders said. She believes, the donation will help the Liberian airport to play its unique role as the country’s indispensable link to the world. Amb. Elder used the medium to remind Liberians of the RIA importance to the outside world, stressing that the airport will soon be used by the global community to come and observe the country elections. “I would be remiss if I did not use this opportunity to once again drive home a message that I think is vital important and worth repeating concerning elections,” Ambassador Elder intoned. She admonished politicians in the country to promote a sense of what she called “Liberianness” by putting the interest of the country above parties or county lines. Elder further wants citizens across Liberia to help ensure a peaceful electoral process, pledging the US continued support to Liberia historic transition. Receiving the donation, Liberia Airport Authority Managing Director Wil Bako Freeman lauded the U.S. government for the gesture. This, according to Mr. Freeman showcases a longstanding support and relationship between the Liberia Airport Authority and the U.S. government, recounting far back as 1924 when the landing field was built. He said the US has remained supportive to the RIA since the Liberian government took over its operation from Pan American Airlines in 1984. “That support continued at a crucial time after the elections, when in 2009 U.S. government through USAID provided much needed equipment to the airport at a time of dire need,” Freeman asserted. He pointed out fire trucks, high loaders, baggage tractors, generators and a passenger bus among others as equipment the U.S.government provided the RIA at the time. The equipment according to him, immediately elevated the airport to standards required which provided it the chance to handle more and larger aircrafts that put Liberia on a right trajectory. Freeman stated that the RIA is still using most of the equipment given them by the U.S. government. The RIA Boss revealed that works are being carried out at the RIA runway which has significantly improved for ground service equipment to move along smoothly. He said the RIA terminal construction is already completed, noting that the airport management is also working on a new terminal that is expected to be completed by the middle of 2018. He however attributed these growths of the RIA to massive support it received from the U.S. government through USAID. Freeman meanwhile assures the US Embassy that the equipment will be used effectively in handling flights currently operating at the RIA.